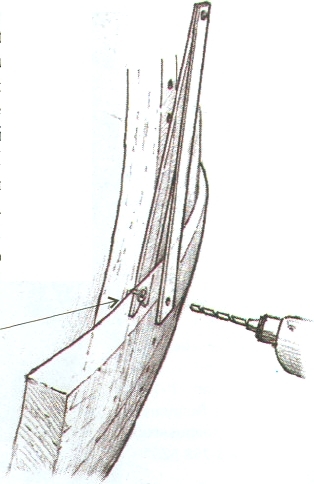 When replacing planking, often you have to drill a new hole through the wood and “hit” the existing hole on the frame (so as not to riddle the frame with new holes). This tool will help you properly locate the new hole. 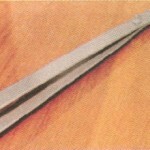 You can either modify a set of barbecue tongs to make this tool, or fashion one from strips of aluminum. Drill a hole in the blades. 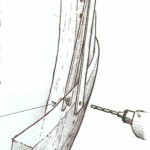 Attach a pointed stud to the lower blade. Slip the lower blade behind the plank. Use the stud to find the existing hole in the frame. The hole in the upper blade allows you to drill through the plank in exactly the right spot. Making a hole locating tool. V-shaped slot helps find protruding bolts. 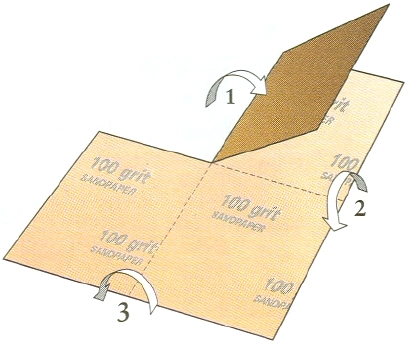 Here’s a way of folding paper for hand-sanding so that grit sides don’t rub against each other. Reverse the fold order to expose the two unused sides.